It's a fast growing trend in the wedding world with no signs of stopping. It can be a great wedding day gift for your groom, and can also be the perfect opportunity to show yourself how beautiful you are. Boudoir Photography is a fast growing trend in the wedding world with no signs of stopping. It can be a great wedding day gift for your groom, and can also be the perfect opportunity to show yourself how beautiful you are. We love boudoir photography for maternity pictures, gifts for him on a special occasion, and even as gift to yourself! See what Pantone has in mind for us for Spring 2016. See Liz and Michael's hazy day wedding. 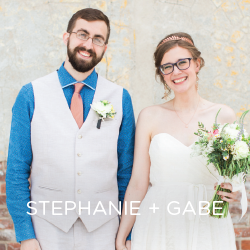 See Stephanie and Gabe's whimsical wedding day.